Thanksgiving has changed for me over time. When I was younger, and my father was alive, Thanksgiving was a day of service rather than a gorge-fest. My dad was not a football fan, and countless drunken friends and relatives visiting year after year for the feast never sat well with him. He made a point of volunteering Thanksgiving mornings to what he said was to “gain perspective on being thankful.” Part of that I’m sure was to escape the mayhem and a house of women arguing about cooking and male arguments about the football game. I’d like to think it was more than just about him in that he genuinely wanted to help in the only way he knew how which was to give his time and attention to someone in need. Some years he spooned out soup and sandwiches. Most years he joined a team of men that would do repairs on the homes of the elderly and disabled. He volunteered every year to do something until his health failed him in the summer of 1995 and he died in January of 1996. I miss him. I grew to do the same in later years and for very much the same reasons. 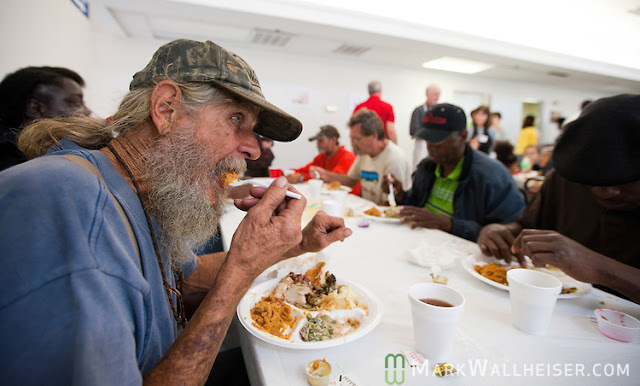 I usually volunteered at homeless events; serving food and giving out warm clothing. On most occasions, I got to take the cats with me (Jake, Maus, and Moshe Moshi). I didn’t post about it on “Coffee, Cats n’ Yarn” or on this blog because I didn’t want to exploit the plight of the homeless and admittedly, I also at times felt a little guilty. Friends and Family that wanted me to come to their homes for the holiday would chide me a little, first because I wanted to bring my pets, but later about my taking my fancy pets to visit homeless people, questioning the optics and the ethics. Though I could always justify it verbally, internally I struggled with the appearance of disconnect and shallowness. I didn’t think I was either but could see how it looked to some people. Was I missing something obvious? This Sunday past, I took the naked kidz on a photo shoot for the holiday card. Teri (of Coco, the Couture Cat) and I had a great time hanging out at Just Fur Pets and the Merrifield Gardens with our kitties. On my subway ride home, while waiting for our transfer train, a homeless man came up to the stroller and started talking to the cats (and me too). His face lit up when I opened the hood, and Lexi Liu popped up her head to look at ant touch this bearded man. It was good for me to see that the cats affect people in a positive way. The man and I talked for about 30 minutes as we rode the subway to the end. He wished me a happy holiday and told Lexi Liu to be a good kitty. I thanked him, gave him my scarf and wished him a safe and warm night. He smiled, turned and walked away into the night. I pulled out my cell phone, hopped in my Uber ride and went home. I don’t have any object lesson in this. For a brief moment, two strangers met and shared some time without condemnation or judgment. I can be aware of my privileged life and still share the best of me, and he can be happy to pet a cat. I know most of my friends and family don’t understand what they call “the cat thing” and I’ll admit the stigma of cat lady really bothers me. However, my cats bring me joy, and I like sharing that with other people. To see this man smile, whether it was just the cats or my participation in it, I don’t know that it mattered for the moment.